August 2012 is officially the 50th Anniversary mark for the birth of my favorite comic book character, Spider-Man. In a perfect world, I would have planned something more celebratory for Chasing Amazing this month, but alas, that’s not in the cards. 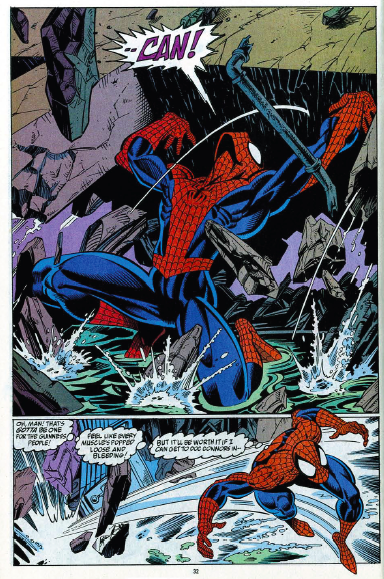 At the very least, let me dedicate my most recent “Remembrance” post about Spidey’s anniversary celebration from about 20 years ago – found in the pages of Amazing Spider-man #365. ASM #365 isn’t necessarily a favorite issue of mine – though it did initiative a long-term story arc (the return of Peter Parker’s parents) that I liked probably more than I should have. It’s certainly not my most valuable comic– not by a long shot, for reasons I’ll explain shortly. However, it’s an important piece in my collection only because I’ve long believed it encapsulates a significant era in comic books and collecting. People who have been reading or collecting comics for more than 20 years will note that the early 1990s was the upper-most peak for a period known as the comic book boom. Driven by the success of mega-crossover titles and movie franchises like Batman, comic books were at the peak of their popularity, driving a lot of new people into the hobby. The “big two” comic book pubilshers, pandered to these new folks by released a number of “collector” editions that were packaged with special polybags, or inter-connected/variant front covers, foil embossing, etc. And people ate it up. Comics like the Death of Superman and X-Men #1 sold millions of copies. People hoarded these editions in hopes that they had stumbled upon the next Action Comics #1 or Amazing Fantasy #15. Apparently supply and demand was a foreign concept to them. 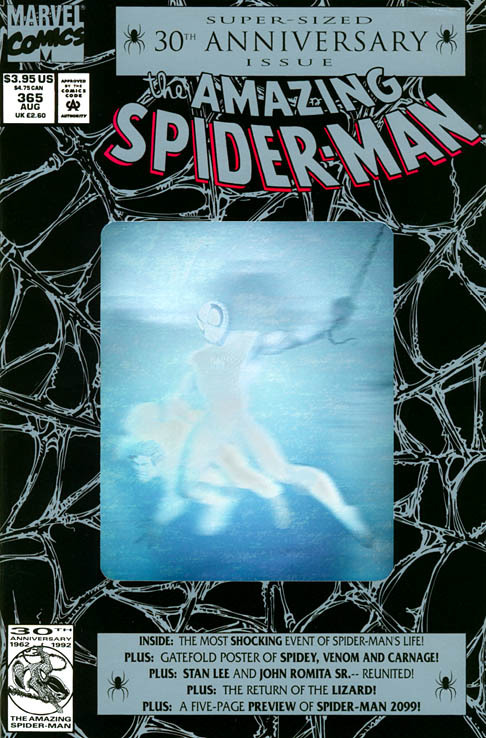 And then eventually, the bubble burst, rendering these comics worthless, including this special 30th Anniversary edition of ASM, complete with a hologram image on the cover. Of course it’s easy to look back at this era 20 years later and sound all self-righteous about the obvious greed exhibited by the publishers and collectors. It still doesn’t change the fact that just the thought of this one issue of ASM brings me back to this era. It’s unavoidable. Whether you think the hologram on the front is gaudy or cool, there’s no denying that this was a comic book that was directly marketed to be “special.” As a comic book fan and collector, you had to own this issue because there was nothing else like it on the newsstand. Until Marvel went ahead and did it 500 times over with other Spidey titles and other series in general. And again, there’s nothing necessarily “wrong” with what Marvel did here, but I often wonder how different the 1990s run of my ASM collection would look if it wasn’t filled with gimmicky covers and storylines – the gold foil cover of ASM #375, Maximum Carnage, the grave stone die-cut for ASM #400. Part of me still looks back at this era with nostalgia – it really wasn’t until the early 1990s that I became a full-fledged Spider-Man fan and collector anyway, and I got to think that the “collector” bug was driven in part by Marvel’s marketing efforts. Still, I look at how straightforward and clean all my comics from the 1960s, 70s and 80s look and I got back to that early 90s box and it’s like a broken down carnival in there. Then, if you compare to the ASM #365 cover to its inside, the contrast becomes even starker. You have this dated hologram image on top of a quintessential Mark Bagley penciled issue. There are a number of artists I rank above Bagley in terms of personal preference, but there’s no denying the subtle style and timeliness to his Spider-Man (and his supporting characters). You can still find Bagley-drawn or inspired Spider-Man images in popular culture today (on lunch boxes, backpacks, t-shirts), but you’re not going to find a hologram cover unless Marvel is trying to be intentionally ironic. 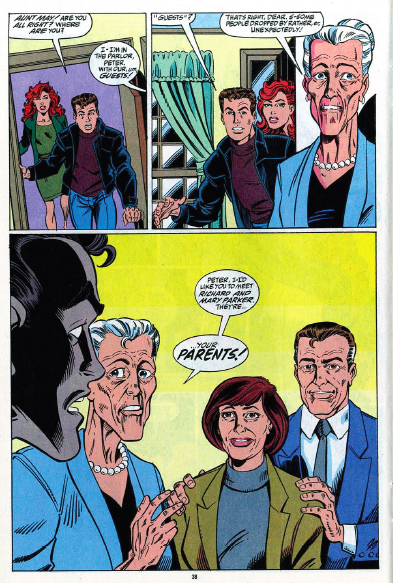 Meanwhile, yes, I liked the Return of Peter’s Parents storyline. 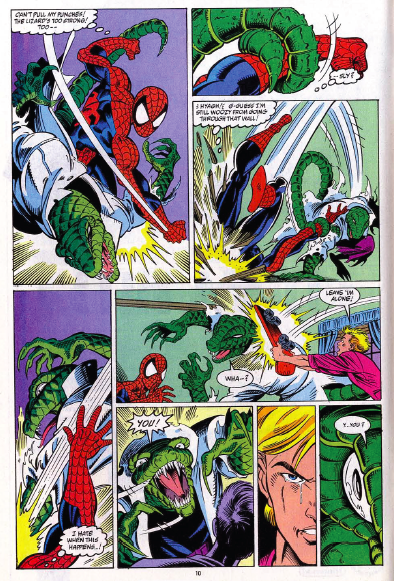 Sure it was a token early 1990s Marvel shtick in itself, and there was some definite eye-rolling when yet another Osborn was exposed as the mastermind of a plan to torture Peter (though not as much as when Norman returned from the dead a few years later to admit he orchestrated the clone saga). This is clearly a case of nostalgia lending me some rose-colored glasses for a Spider-Man story. That’s not to say that Marvel still doesn’t return to its early-90s era storytelling/marketing tactics (Brand New Day, Spider-Man in the Fantastic Four, AvX, all the variant covers, etc. ), but I still feel like reading and collecting comic books today is at least more akin to what folks experience in the 60s and 70s. Less crossover storylines you HAVE to buy. “Special” editions that are driven more by story rather than outer aesthetics. Overall, just a more routine and casual buying and reading experience. Perhaps by firmly moving away from some of the decisions that come them into trouble 20 years ago, Marvel has made me look back at this era with a wink and a smile, rather than something far more cynical. “A broken-down carnival”! What an apt analogy to use for comics from the 90s, especially when seen all together. Thanks for a hearty laugh! I was pretty dissapointed with this issue too. “All the anticipation, and I just got a trashy Lizard story?” The back stories in the 90’s always seemed to have bad artists, with the exception of a few. My only complaint is your comment on Mark Bagley. I love his art. I loved him before I knew about his art on Ultimate. He is, just before McFarelane, the best Spiderman artist. I definitely didn’t mean to sound like I was slighting Bagley. I love him. I would just probably rank JRSR and Gil Kane above him, and for something different, definitely McFarlane.